Ambra, Gomma, Heliotrope, Lemon Sorbet, Magot, Messe de Minuit, Palais Jamais, Patchouly, Royal Pavilion, Sandalo, Vetiver, Shaal Nur. I've owned all these Etro perfumes. A new bottle of Vetiver arrived at my home last week, and I've bought many bottles of Magot, Sandalo and Messe de Minuit, too. When ManRose1 was released I had to try it (though my love of Etro perfumes stops around 1997...recent releases have been "nice," but don't appeal to me like the older fragrances). I love the scent of roses and almost go bankrupt each (dry) Northwest summer watering the plants that keep my home smelling rosy from May till October. Rose appears as a note in many men's fragrances these days, though it's usually a bit player (you can't let your attention wander or you'll miss it). I'm not afraid to wear full-on rose fragrances as long as the rose is deep and rich and augmented with some gusty ingredient like black pepper, cumin, cardamom, leather/saffron, vetiver, wine/booze, resins/woods or musk (even musky strawberry, currant or pineapple). I like my roses so red they're almost black. 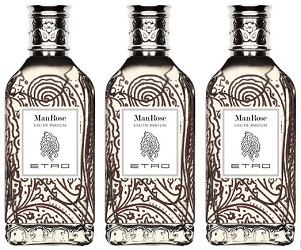 Enter: ManRose, my favorite Etro fragrance in ages. If someone had given me an unmarked vial of this perfume to sample, I would have guessed it was one of Jean-Claude Ellena's Les Jardins fragrances from Hermès — perhaps Un Jardin à Isparta (where Rosa × damascena oil is distilled). ManRose, like my favorite Les Jardins fragrances, has a playful air. It begins with vibrant citrus and lots of pepper, geranium leaf and a 'liquid' rose. The image and scent that came to mind was a rose garden situated by a lake or river...where fresh air flows through the blooming rose bushes. (No, there are no annoying aquatic notes in ManRose). Even the base of ManRose is refreshing, with some light patchouli, woody vetiver and a hint of cedar. The rose note lasts from start to finish. Men: what are your favorite rose perfumes? Women: what rose perfumes do you wear that you feel men would enjoy? Etro ManRose Eau de Parfum is €130 for 100 ml. For buying information, see the listing for Etro under Perfume Houses. 1. Listed notes of bergamot, pepper, cardamom, Turkish rose, geranium, patchouli, vetiver, musk, elemi, incense, leather, amber and woods. Note: top images of roses by the author. 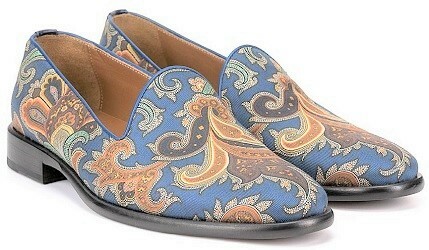 Shoes available for viewing (and buying) at Etro. The last time I tried Habit Rouge (the EDT), I was quite taken aback by how rosy it smelled; for whatever reason, the first time I tried it I’d been distracted by the citrus, orange blossom, powder and dusty library aura (I was actually in a bookstore at the time) and missed it completely. Perhaps it came out more in the rain? I wasn’t sure what to make of all that rosiness. Anyway, some time later, I was teaching an art class and a student lit a stick of incense in one of the studios, while in an adjacent room, another teacher had brought in flowers for a still life… the scents overlapped and there was Habit Rouge! It has been stalking me ever since so I am getting a bottle. John, I have vintage Habit Rouge…will have to wear some tomorrow…rose was never strong when I wore it, but carnation was for sure. Love Habit Rouge, especially vintage! Great that you liked this one. On my skin ManRose smelled a bit flat and it didn’t have much lasting power. Maybe because my sample was a dabber? I don’t know. I’m quite a rosey kind of guy, my favorites include Atelier Cologne Rose Anonyme, Diptyque Oud Palao, Jul et Mad Nin-Shar, HdP Rosam or Atelier des Ors Rose Omeyyade. Less masculine but I adore it – VC&A Rose Velours. Lucasai, my samples were dabbers, too…but I never dab…I pour! Will look for some of your recommendations. I think Rose Anonyme would be fantastic on a guy! This sounds like something I would like and also would like on my male person. I wish he’d try more roses. A question: are the new bottles of the older Etro perfumes as good or close to older? I am thinking of the vetiver and Messe de Minuet especially. Also I went sniffing with friends today at Barneys and finally had a chance to try Dirty Velvet, Purple Fig (and others.) I was bad and bought the wildly overpriced travel sprays. So thanks Kevin, for setting me on the road! I’d really like to smell Estee Lauder’s Knowing on a guy. Also going to +1 Lucasai’s mention of Rose Anonyme. Not going to happen in my household, though. Perfume is very much my thing, not Mr. Jalapeno’s. He is very tolerant of my scented obsession, though, and has a pretty good nose. Japapeno, just the name Estee would send many guys running in the opposite direction…. I always thought Knowing was inherently genderless (they advertised it with a woman in a man’s tux) and wore it pretty much from the day it was launched. They’ve kind of wrecked it now, or at least changed it so much that I don’t like it any more (got rid of the oakmoss, which is the story of modern perfumery), but I still have a bit of the vintage parfum and it is astounding. pyramus: alas, I never smelled it, pre- or post-reformulation. If you’re interested in trying some vintage, I’d love to send you a sample. It’s fantastic and potent!???? What a great idea! This weekend, I’ll make my hubby try Knowing. The sillage and longevity of my vintage bottle are off the charts. We’ll see how that goes. ???? I am OBSESSED with roses these days and I don’t know why. Last month I bought three Diptyque solids and all of them were rose-themed, I’ve worn the rose-drenched Czech & Speake No. 88 and ELdO Rossy de Palma so much this past spring, and I keep visiting the local Sephora to see if they’ve ever gotten the travel spray of Atelier Cologne Rose Anonyme (because I need it but not a full bottle). Clearly I am going to have to get a sample of ManRose. P: hope you like it…I love No. 88, too. This sounds intriguing, Kevin! I’m very fond of Etro, especially Gomma and Palais Jamais. How about Miller Harris Geranium Bourbon as a rose for guys? noz: that would work…rose geranium is a great substitute or “starter” rose. I think it’s got actual rose, too, but complimented with herbal, spicy and woody notes rather than more feminine sweetness. Noz: have you smelled Aedes’ Pelargonium? Yes, not the best test because I was in a room full of perfume, but it seemed more the kind of rough, peppery, woody notes that I’m not fond of, very dry. Of course, that might work well for a guy. The AdV blurb quotes Nathalie Feisthauer describing it as “aromatic, with a crushed-leaf facet, less fruity and more balsamic than rose, almost incense-like.” Elsewhere she said she knew AdV would want their incense. Noz…ah…I still have not had the chance to try it. Have you tried Creed’s Vetiver Geranium? It’s so lovely. I think it’s one of the Creed’s that turn easily though. I’ve noticed differences when trying it at various stores. Such a shame bc it’s a fresh rosy vetiver. My partner wore Nahema the other day and it was great on him. He didn’t know he was wearing it, though. It’s cold in our house in winter so often I wear his jumpers over the top of what I’ve got on (I work at home) and then to relieve the boredom of work I spray perfume and that usually settles on his clothes… so far I like Nahema better on him than me, and he was rocking Prairie Nymph yesterday. Kanaka, that’s a great story! I like your stealth-application. ???? Kevin, I bet you and littlecooling smell great in Une Rose! I love a little rose on a man, and this on the right man…… I’d need my fan! My favorite Etro is Gomma, and I got a couple of the old bottles when they were still inexpensive. The newer ones I’ve tried have been meh. ManRose, however, will go on my test list. 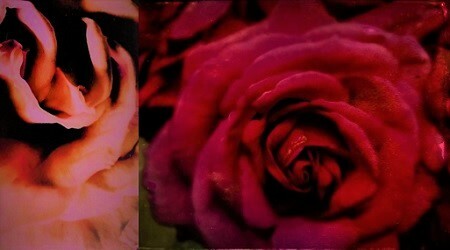 Two other roses I would like to smell on a man are ELdO Rossy de Palma and Terry de Gunzberg Rose Infernale. They have some real “heft.” Hope your roses do well this year! AnnE: thanks…they are blooming like crazy now…I’m running out of vases and I have VASES. I have an adore Rose de Taif, by Perris Monte Carlo. It is really just rose, and it’s strong. So I’m not sure it would suit men in general. But for anyone who gardens, this is the real, true scent of a rose in your garden (it comes very close to my beloved Abraham Darby rose). It’s rose with citrus and spicy notes. Very rich! I’d be happy to send you a sample of Rose de Taif, though I don’t have FB of the others. Same email as my handle, at gee mail. Thanks, TL…that’s sweet of you, but I have my “suppliers!” HA! Even better! Hope you like it! There’s a really good one almost nobody has tried, apparently: Magnet for Men by Eclectic Collections. One might still be able to find it at the low prices I paid, not much more than one would pay for a cheeseburger! I guess my favourite rose would be Rive Gauche. I like Mohur too but maybe not for these recent hot days. Nicolaï’s new Rose Royale is a lovely fresh rose for this weather! Portrait of a Lady would smell gorgeous a man! However, I’m not anxious to share my bottle with hubby! ???? When he wears TF Noir, I can really smell the rose on him. I love smelling roses on women and men. Laura, yes, lots of men wear Portrait of a Lady, at least when you read comments on fragrance sites. I guess admitting to “ManRose” is easy compared to PoAL! Dude here. I’ve worn Knowing off and on since 2008…great stuff, however the new formulation is being judged otherwise, deep and mossy. I have a full bottle of Rossy de Palma I wear regularly (not all at once!). While I prefer the clovey version of Royal Oeillet by Oriza L. Legrand, the rosier Oeillet Louis XIV is terrific too. And of course Le Labo’s Rose, while not rosy at all, is nonetheless a showstopper while it lasts. But doesn’t most good perfume have a little rose in there? I’m thinking Rien in both incarnations, Van Cleef and Arpels First, Rive Gauche, Chanel no. 5, Coco Mademoiselle, etc.